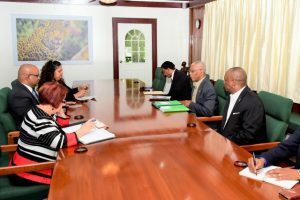 President David Granger and Opposition Leader Bharrat Jagdeo on Wednesday failed to reach consensus on the appointment of Justice Kenneth Benjamin as Guyana’s next Chancellor of the Judiciary. However, by the time they meet again on February 7, 2018 the People’s Progressive Party (PPP) intends to conduct background checks on the candidate, Opposition Chief Whip Gail Teixeira said. The President also wants to appoint acting Chancellor of the Judiciary, Justice Yonnette Cummings-Edwards as Chief Justice if Benjamin is appointed. Currently, Justice Roxane George-Wiltshire is acting as Chief Justice. Teixeira, who participated in Wednesday’s talks, said no views were shared with the President about Chief Justice Benjamin’s track record in Belize about dealing with a backlog of cases. 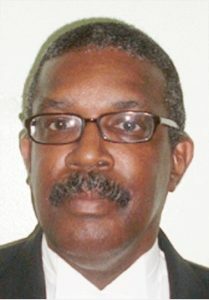 Benjamin served as Chief Magistrate of Antigua and Barbuda of which he is also a citizen. The Opposition Leader is not constitutionally required to nominate anyone for the post of Chancellor of the Judiciary or Chief Justice. However, the President must obtain the Opposition Leader’s agreement before either of those two two judicial officers are appointed. “The intention is to have a consensual candidate, to try to get agreement,” Teixeira said. A number of legal experts have said that if the Opposition Leader agrees that Benjamin should be appointed Chancellor, he would first have to be recommended to the President for appointment as a judge in Guyana by the Judicial Services Commission (JSC). The JSC is yet to be reconstituted.